Food for the trip is the perfect thing. My first thought was cookies, but wanted to give them something more in line with the race. You know, a little bit health conscious and some unexpected fun! Thus, the Cranberry Almond bar seemed ideal. 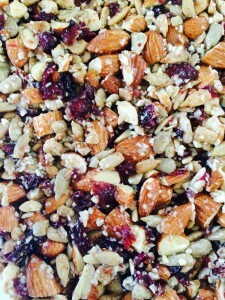 When you make this you are going to be blown away at how easy they are to make, how inexpensive they are compared to buying premade protein/granola bars and quite honestly how fresh and tasty they are. They are crunchy because of the fresh nuts, but chewy because of the honey as the glue. Deliciousness at it’s finest! I made my own almond meal by just throwing some almonds into my Cuisinart food processer and pulsing it until it was mealy. I found I liked the almond meal with a little more texture than finely ground when I was playing with the recipe. Mine looked like steel cut oats when finished; you could still see the nuts somewhat, not pureed to a flour. Note the larger bits in pic– its the almond meal! 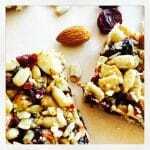 While this recipe uses salted sunflower seeds I’m already playing with many options. Salted pecans, salted peanuts. This recipe is so easily made with whatever you have already in your pantry. You can customize the nuts and dried fruits to your preferences. The biggest problem with these is you can’t keep them around. Anyone who sees them wants one, and they disappear before you know it. Place 1/4 cup of Raw Almonds in a Cuisinart Food Processor. Pulse for 2-3 minutes until mixture looks mealy, kind of like a steel cut oatmeal. You can still see that it is a nut, and its not a powder like flour. Add 1/3 cup Honey and 1 tablespoon olive oil to bowl and Mix these items completely. Press mixture into the bottom of your pan and tamp it down firmly. Bake at 325º for 15 minutes or until bars are set and lightly toasted. Then remove bars from the pan using the parchment paper edges. Cut into desired shapes and wrap in plastic or parchment for storage. I store them in the fridge so they stay fresher longer, but honestly I've never had them last in our house for more than a week. 1. I have an 8X8 pan, but Ive also done these in a 9X13 pan. It changes the thickness, so just watch them as they are baking so they don't over crisp. You want to have them remain somewhat chewy! 2. I use Olive oil or coconut oil depending on what I have. Any cooking oil such as canola, vegetable or corn oil would work. Just make sure it's a mild tasting oil. I wouldn't sub sesame oil, or a kalimata olive oil for example because that would be adding a very strong taste to your bars. 3. I love a brightness to my bars, so I added a drop of orange oil. If you don't have it it is still just as yummy. 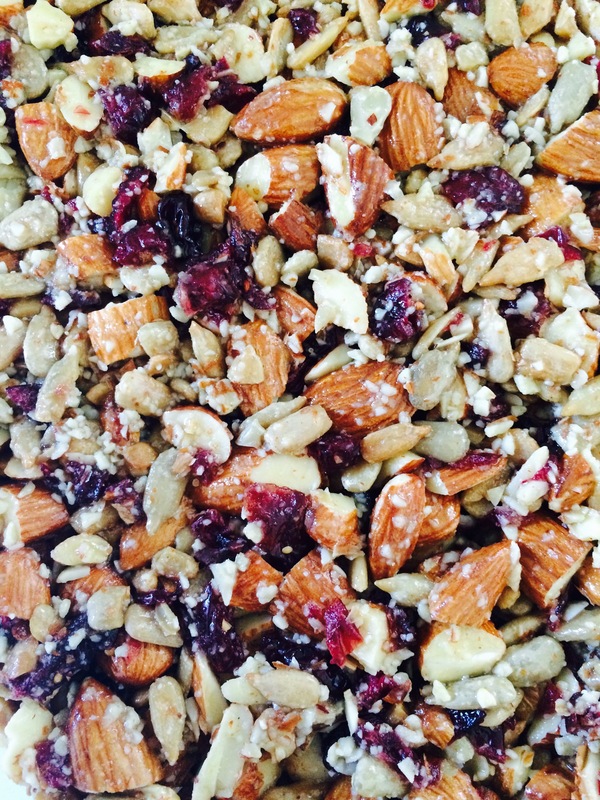 You can also use those amazing orange flavored dried cranberries if you have a Trader Joe's nearby. They add the same brightness. This recipe is adapted from about 15 different people on Pinterest and a recipe on Better Homes and gardens! Hey Spartan Friend! LOved this, but I could have used a dozen of them! These look great! Love the packaging cheer, too!